Iceland's 'Viking Thunder Clap': the original and best. I hate to say I told you so, but, y’know, I kinda did, four weeks ago, right here. And you thought this column was dashed off during TV3 ad breaks? It’s been great, Euro 2016. Italia ’90 great. As in, the football hasn’t been much good but the stories have been brilliant. Wales, Iceland, Northern Ireland. Oh go on then, Ireland too. My favourite moment? A career high, the realisation of a childhood dream in front of a captivated Irish nation. No, not Robbie Brady’s goal against Italy, I’m talking about Aprés Match taking me off. They even got the eyebrows spot on. It’s all downhill from here really. Anyway, here are my Euro 2016 awards (I know, spoof awards, how original. But like Aprés Match, it’s a well-worn format that always works). I have decided to name them after the tournament mascot, but as yet The42′s editor has refused my request for a dozen 12-inch Super Victors to give out. …goes to The Irish Fans (TIF™), who, depending on your point of view were either a wonderful gift to humanity or a total disgrace to the nation. Honestly, there hasn’t been such a divergence in opinion during a major tournament since, well you know. The thing is, it’s that very split personality that makes us so likable when abroad. We’re self-confident enough to be a bit of a laugh, but self-loathing enough not be threatening. AND we fix old people’s flat tyres! Belgium manager Marc Wilmots was in fine form after their win over Ireland. He took full credit for the turnaround after their opening defeat to Italy and pooh-poohed suggestions that he wasn’t up to the job of coaching the tournament’s most talented squad. “People being negative, that’s not interesting for me. I want to be with positive people. People who criticise are never going to have a good life,” brayed the former Sint-Truiden supremo. But concerns about him proved correct when Belgium fell apart from a winning position against Wales. They looked what they were: a collection of talented individuals lacking a coherent plan. And Hal Robson-Kanu doing a Cruyff turn in your penalty box is never a good moment for a manager. A formality: this title is the birthright of whatever poor wretch happens to be managing England at the particular tournament in question. Roy Hodgson has carried the seal with distinction for three tournaments now, developing the role beyond even what Graham Taylor would have thought imaginable. The fascination with Jack Wilshere and Raheem Sterling; using untried formations; shoehorning Wayne Rooney into midfield; the wholesale changes that may have cost his team top spot in the group. He probably shouldn’t have built a team around a knackered Spurs core either. He even mastered sports psychology in the aftermath of England’s draw with Slovakia: “We’re not doomed yet!” Hodgson declared, striking a not-quite-Churchillian note. In a tournament which was all about collective solidarity and having a clear identity, Hodgson’s England had neither. There were no Jubilani-style complaints about the ball at this tournament, which led to a decent batch of Euro stonkers. Modric, Dier, Hamsik, Nainggolan (twice), Gera, Hazard, all hit balls that stayed hit, so to speak. Xherdan Shaqiri’s bicycle kick for Switzerland against Poland in the Round of 16 was a bit special, albeit in a losing cause, and arguably goal of the tournament in purely aesthetic terms. But Dimitri Payet’s left-footed winner for France on the opening night against Romania will live longer in the memory, getting the party properly started (sorry David Guetta) and igniting the home nation’s run to the final. 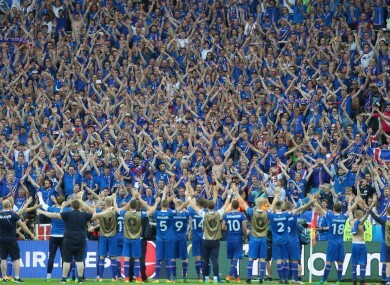 Please don’t hold the appropriation by others of the Thunder Clap against the good people of Iceland and their wonderful team. They had barely left the tournament when their simple, powerful call to arms was hijacked. When France celebrated their semi-final win over Germany with the now familiar ‘Huh!’ it was bad enough, until you realised THEY’VE ALREADY GOT THE BLOODY MARSEILLAISE! The moment of communion between players and fans after Iceland’s win over England deserved to be treasured, respected and left to them. Honourable mentions to Jogi Löw and his scratch ‘n’ sniff antics and to Martin O’Neill and Roy Keane’s ‘Je T’aime’ moment in Lille. But Antonio Conte was thrilling to watch throughout Euro 2016. Conte was the reason the most limited Italian squad ever assembled came within penalties of a European semi-final — and didn’t we know it. He berated, gesticulated and strutted his way around his technical area and beyond. He was a like psychotic, Armani-suited One Man and His Dog contestant, whistling and pointing furiously to wherever Marco Parolo or Alessandro Florenzi or whoever were supposed to run next, in which direction they would invariably trot. Good dog! Gareth Bale should probably get it for dragging Wales — Wales! — to the semi-finals. Antoine Griezmann could get it for being a nation’s sweetheart, a lovely footballer and a goalscoring machine. But how can we ignore the man who dissed Iceland, threw a microphone into a lake, missed a penalty, scored a few goals, missed a load more, cajoled teammates into taking penalties, leaped like a salmon for the header that helped take his nation into the final and then delivered a patronising post-match sermon to an uppity club teammate/rival he’d just defeated, all while regularly checking the big screen…it has to be Ronaldo. Rarely brilliant, but you couldn’t take your eyes off him, much like Euro 2016 itself. Email “Thunder claps, turnips, and tyre repairs: Tommy Martin hands out his Euro 2016 awards”. Feedback on “Thunder claps, turnips, and tyre repairs: Tommy Martin hands out his Euro 2016 awards”.